A cropped image showing Sydney Harbour, taken at night, by NovaSAR-1. The original image showed an area of the coast 87km long by 20km wide. Credit: SSTL. 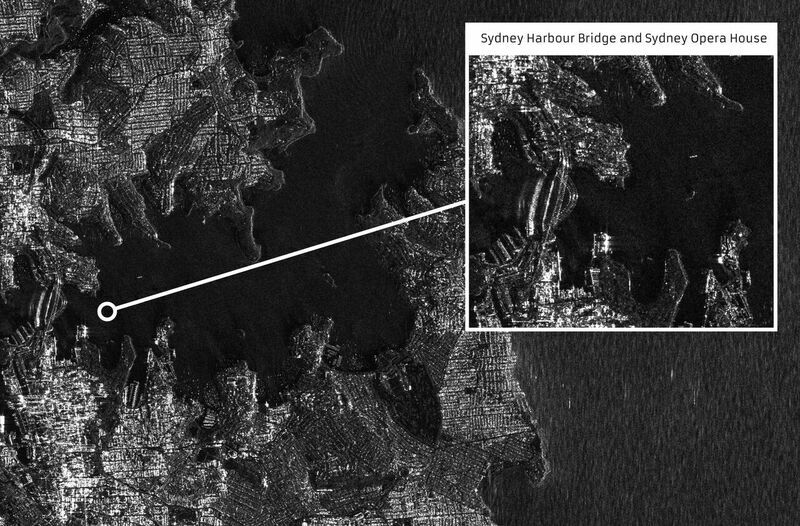 Sydney Harbour, the iconic Harbour Bridge and Opera House, Bondi Beach and several boats crossing the harbour are among the details you can see in the first images taken by the new NovaSAR-1 satellite. What’s most amazing about this image is that it was taken at night when these features would not usually be visible. NovaSAR-1, which was launched into space from India in September this year, is a powerful new recruit to the team of satellites monitoring our planet from above. And its ability to ‘see’ through clouds, dust and haze – and at night – opens up the possibilities for our research community. The satellite carries an advanced form of radar technology known as S-band Synthetic Aperture Radar, or S-band SAR. It can take high-resolution images, capturing objects as small as 6m long (it can see a bus, but not a car, and can’t track the movement of people). 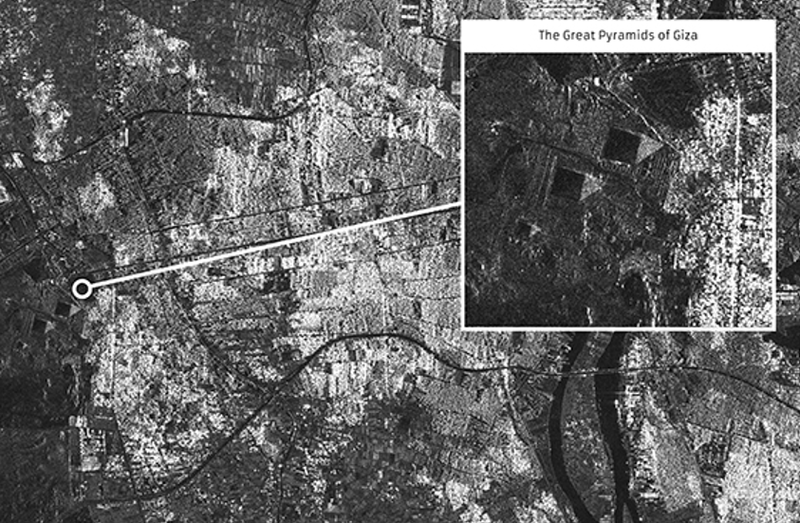 This cropped image taken by NovaSAR-1 over Egypt shows the Great Pyramids of Giza, as well as the mixed land uses in the area. Credit: SSTL. Data collected by Earth observation satellites is incredibly valuable: it enables us to make weather forecasts, track the progress of bushfires and monitor floods, as well as do longer-term monitoring for environmental management. SAR images, like these new images of Sydney Harbour and Cairo, have a wide range of applications for monitoring different environments. They allow us to map changes in the way land is used, assess vegetation health, monitor disasters such as floods and, over oceans, track sea ice and oil spills. We’ll also be exploring whether NovaSAR-1 images taken from slightly different angles can be used to develop elevation maps and even identify areas at risk from subsidence in urban environments. An artist’s impression of NovaSAR-1 over Australia. NovaSAR-1 is a collaborative mission: developed, owned and managed by Surrey Satellite Technology Ltd; Airbus provided the SAR payload; and the UK Space Agency, CSIRO and ISRO are data share partners. Credit: SSTL. We’ve taken a 10 per cent share of NovaSAR-1 tasking and acquisition time, which we’ll operate as a national facility, to enable Australian researchers to direct the collection of data taken by the satellite. NovaSAR-1 will continue to be operated by Surrey Satellite Technology Ltd (SSTL), who designed and manufactured the satellite. Over coming weeks, SSTL will continue to test the capabilities and calibrate the spacecraft while it’s in its commissioning period. We’re expecting to soon begin accepting research proposals, and to commence national facility operations in early 2019. We’ll be operating our share of NovaSAR-1 as a national facility, to enable the Australian research community to monitor the pulse of the Earth. Find out more about NovaSAR-1's out-of-this-world capabilities. This is really good to see. I work with C and L band polarimetric SAR for mapping forests and floods in Australia. So it is great to see an S Band system in space.